Households generate a significant amount of waste, including paper, packaging, yard clippings and kitchen waste. Most of this material is not dangerous and can be safely discarded for disposal by authorized trash collection services. However, some household materials are toxic, flammable, corrosive or reactive, such as paints, cleaners and solvents, oils, pool chemicals, drain cleaners, batteries and pesticides. These items are also known as "household hazardous materials" and require special care when they are discarded. While household hazardous wastes are potentially dangerous, they are not regulated as hazardous waste under federal or state laws. However, each person in Pennsylvania produces an average of four pounds of household hazardous waste each year. If not properly managed, these consumer waste products can and frequently do create environmental and public health hazards. Local household hazardous waste programs provide the opportunity for these wastes to be recycled or disposed in environmentally appropriate ways. Energy Conservation: The reduction and recycling of household hazardous waste materials conserves resources and energy by avoiding the production of more hazardous products. Money Saving: The reuse of hazardous household waste products can save money. Environmental Protection: Proper disposal prevents pollution that could endanger human health and the environment. Potential High Cost: The initial costs incurred in establishing and operating a household hazardous waste program may be significant, although financial reimbursement may be available (see Implementation below). Organizational Requirements: A household hazardous waste program requires a time and organizational commitment from municipal staff or volunteers. Regulatory Complexity: The program operator must be aware of and comply with all applicable local, state and national standards pertaining to hazardous waste management. Assistance in the proper disposal of hazardous wastes is available from municipalities, corporations, public utilities, and trade associations when they are authorized to sponsor collection programs for household hazardous wastes and similar wastes from eligible entities. Entities that are eligible to participate in these events include households, municipalities, home owner associations, and small businesses. The program's sponsor must register the program in advance with the Pennsylvania Department of Environmental Protection. Planning for collection programs should begin as early as 6 to 18 months in advance of planned collection dates. A group that is considering a collection program should establish a planning committee to set policies and goals, obtain funding and other resources, supervise sponsors, and perform community outreach. The planning committee should also determine the types of materials that will be accepted. In order to minimize costs, programs can target specific recyclable household hazardous wastes such as used oil, pesticides, car batteries and paint. The sponsor committee must engage a waste management group that is licensed to store, transport and dispose of household hazardous wastes in accordance with federal and state requirements. Some items must be excluded from collection when the waste management group is not licensed to receive those materials or does not have the necessary equipment to handle or identify certain materials. The planning committee should also determine whether it will set a limit on the amount of waste that each participant can bring to the collection, which can also save costs. Additionally, it should be decided whether the program will accept hazardous wastes from small commercial businesses, whether there will be limits on the amount of waste such businesses can bring, and whether any additional fees will be required. 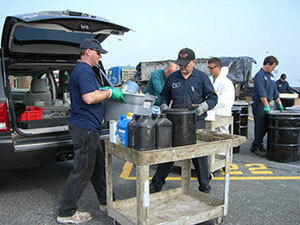 Community involvement is critical to the successful development of household hazardous waste programs. Municipal officials need to be involved in order to build community acceptance and develop a sense of community ownership to ensure greater participation on the collection day. Many communities use a combination of collection methods to maximize participation, including one-day drop-off events, permanent drop-off facilities, drop-off at mobile facilities, door-to-door pickup, and curbside collection. Most programs begin with one-day drop-off events. However, a one-day event may result in long waiting times to drop-off materials, and the chosen day may not be convenient for some residents. If the limitations of one-day events hamper the program's effectiveness, a permanent drop-off program should be considered. Costs can be a major deterrent to establishing a hazardous waste program because wastes must often be transported to incineration or recycling facilities at significant expense. Municipalities hosting municipal waste landfills or resource recovery facilities may be able to fund programs with a "host municipality fee". Act 155 of 1994, The Household Hazardous Waste Funding Act, reimburses municipalities for 50 percent of the developmental and operational costs associated with household hazardous waste collection programs, up to a total of $100,000 per county per year. Act 190 of 1996, the Small Business and Household Pollution Prevention Act, will provide 80 percent grants to counties to develop and implement pollution prevention education programs for households and small businesses, even if conducted in the absence of a collection program. Municipalities must be registered with the State to be eligible to take advantage of the reimbursement. Act 247, the Pennsylvania Municipalities Planning Code (MPC) permits municipalities to address solid waste management as part of a comprehensive plan (Section 301.(a)(4)). The Municipal Waste Planning, Recycling, and Waste Reduction Act (Act 101 - Section 1512) as amended by Act 190 of 1996, the Small Business and Household Pollution Prevention Act of 1996, authorizes programs to collect and manage household hazardous wastes, provided they are registered with DEP.